One of the least reported issues related to health care cost inflation is the existence of artificial government restrictions on health care supply, often called "certificates of need". 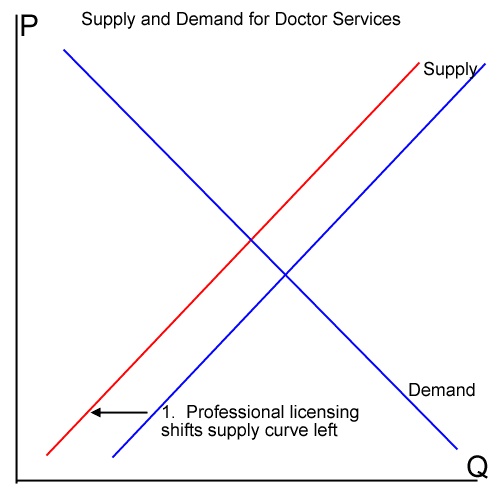 The COPN [certificate of public need] law is supply-side Obamacare: top-down, command-and-control restrictions on which providers can offer which services. A certificate of public need is, essentially, a government permission slip. Without one, a Virginia doctor can’t put an MRI machine in his clinic. A hospital can’t build a new wing. A hospital company can’t add a satellite campus. And so on. Getting such permission slips is a long and costly process. The owner of a Northern Virginia radiology practice, for example, spent five years and $175,000 asking permission to buy a new MRI machine. The state said no. This is cronyism and protection of incumbent competitors, pure and simple. It is often justified by the economically-ignorant as reducing costs because it reduces expenditures on expensive machinery. But in what industry can you think of does restricting supply ever reduce costs? In any other industry, the proper response to that would be: So what? If Kroger sets up across the street from Food Lion, we consider that good for consumers: They have more choice. And if they migrate from Food Lion to Kroger, that’s not a bad thing. It means they’re getting more utility for their grocery dollar. Studies of the COPN system around the country have confirmed what seems intuitively obvious. A joint examination by the Justice Department and the Federal Trade Commission found that COPN regulations hurt competition, fail to contain costs, and “can actually lead to price increases.” Restricting supply raises prices? Imagine that. If you ordered America's different health systems worst-functioning to best, it would look like this: individual insurance market, employer-based insurance market, Medicare, Veterans Health Administration. Well, I know about a health care system that has been highly successful in containing costs, yet provides excellent care. And the story of this system's success provides a helpful corrective to anti-government ideology. For the government doesn't just pay the bills in this system -- it runs the hospitals and clinics. No, I'm not talking about some faraway country. The system in question is our very own Veterans Health Administration, whose success story is one of the best-kept secrets in the American policy debate. How is a supposedly sclerotic government agency with 198,000 employees from five separate unions outperforming the best the private market has to offer? In a word: incentives. Uniquely among U.S. health care providers, the VA has a near-lifetime relationship with its patients. This, in turn, gives it an institutional interest in preventing its patients from getting sick and in managing their long-term chronic illnesses effectively. If the VA doesn't get its pre-diabetic patients to eat right, exercise, and control their blood sugar, for example, it's on the hook down the road for the cost of their dialysis, amputations, blindness, and even possible long-term nursing home costs....The VA model is that rarest of health care beasts: one with a perfect alignment of interest between patients and providers. Neither of these have ever proven in real life to actually lower costs in anything but tiny pilot programs, and there is a lot of reason to believe that while preventative care can improve health outcomes, it tends to increase costs. 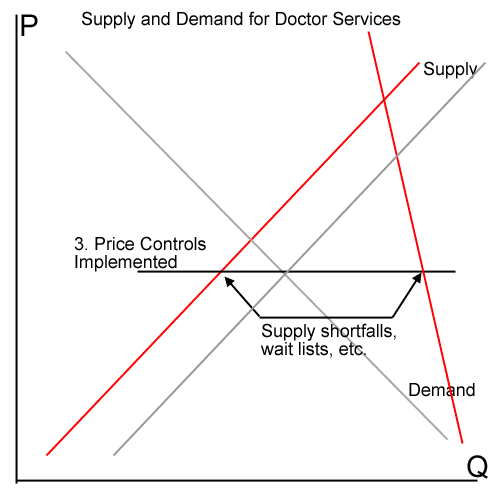 I have said for years that at the end of the day, the only ideas government planners have for cost control are rationing (which leads to queuing) and cost controls on things it buys from private markets, like doctor time (which leads to shortages and more queuing). 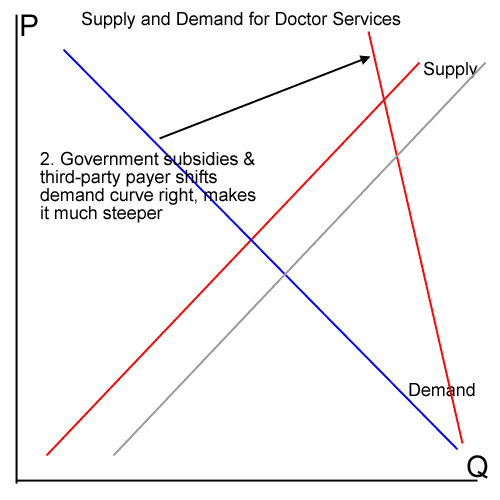 This is why every health care system that offers free care to all comers, whether it be socialist systems in other countries or the VA or even an urban emergency room, has long queues. In fact, the situation, as I think we will find at the VA, is worse. Not only is the old pie being allocated differently (shifting from price-sensitivity to queue tolerance) but the pie of available supply is likely getting smaller as resources are consumed by government red tape and price controls drive suppliers out of the market. The next stories will be about the staggering waste of money on red tape in the VA system, and the stories after that will be about a few VA users jumping the queue because of political connections. This stuff is so inevitable that it was all addressed years ago in my three part series of Obamacare. In that series, the issues were not failing exchanges and the mess we have seen so far, but the issues we are more likely to see over the long term. The VA is merely a preview, but we shouldn't have needed a preview because we could have looked at countries like England. Of course, if the media had any desire to honestly tell these socialized medical stories we would not get fawning profiles of the horrendous system in Cuba. I applaud any effort by this Administration and others to improve the transparency of pricing in the medical field. I would have more confidence, though, if all of you folks were not pushing for 100% pre-paid medical plans that will essentially eliminate price-shopping by individuals, and in so doing effectively eliminate the enormous utility of prices. Prices will soon be meaningful for one thing -- insurance -- in the health care field and absolutely meaningless for everything else in the field. By the way, at the same time you are improving competition on price, you are eliminating by fiat all competition on features (e.g. what is covered, what deductible I want, etc). This "success" is like the government mandating one single cell phone design, and then crowing how much easier shopping is for consumers because there is now only one choice. A simple world for consumers is not necessarily a better world. I am sure Medieval peasants had a very simple shopping experience as well. Most of the Left wants to measure access to health care by the percentage of people who have health insurance, implying that those without insurance have no access to care. But in fact the uninsured in the US have access to better health care than most other people in the world. I talked to [valued employee of my company, call her Jane] this morning regarding her lack of attention from [our workers comp insurer]. I then followed up immediately with [representative of workers comp insurer] working on her account, in Sacramento, CA. It seems the problem is her injury occurred in CA and she's now in MO. The doctors in MO don't want to see her due to the paperwork and issues required under the CA laws. Jane advises she gets relief from going to a chiropractor. I told her to keep going and I would get [insurance company] to approve those visits, which [workers comp insurer rep] said she would. So, it comes down to [our insurance company] trying to find an Orthopedic Doctor who will take her and comply with the CA requirements, which the Drs. don't like. There is no issues on coverage, it's a political issue. Already, Medicare and Medicaid patients have trouble finding doctors to treat them. Enjoy the cozy feeling of being "insured" via Obamacare. Let's hope that when you are sick, there is a doctor who will see you. As the government pays more and more of the health care bills, this price rise leads to unsustainably high spending levels, so the government institutes price controls. Medicare has price controls (the famous "doc fix" is related to these) and Obamacare promises many more. This leads to huge doctor shortages, queues, waiting lists, etc. 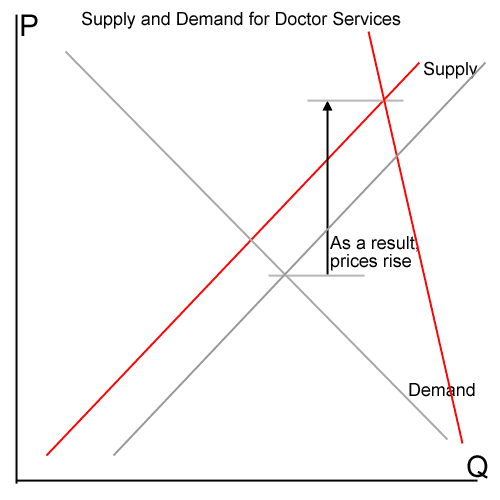 Exactly what we see in other state-run health care systems, The graph below posits a price cap that forces prices back to the free market rate. Over the last 50 years, real per capital health care spending has increased substantially. Certainly there are multiple reasons for this, but the most obvious one is seldom ever mentioned -- that the US has seen huge increases in personal wealth over this period, and unsurprisingly people choose to spend a lot of this extra wealth on their own health and life expectancy. In an age where consumerism is often derided as shallow and trivial, what could be more sensible than spending money on more and better life? Many have pointed to the increased technological intensity of health care to explain rising costs. 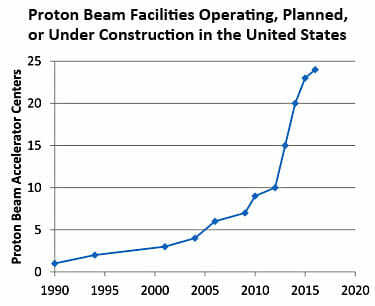 I suppose this could be true, though in almost every other industry in modern times, increased technological intensity has reduced rather than increased costs. One issue that does not get enough attention is the prosaic act of shopping. I spend my own money, and I care about price. I spend someone else's money, I don't give a rip. 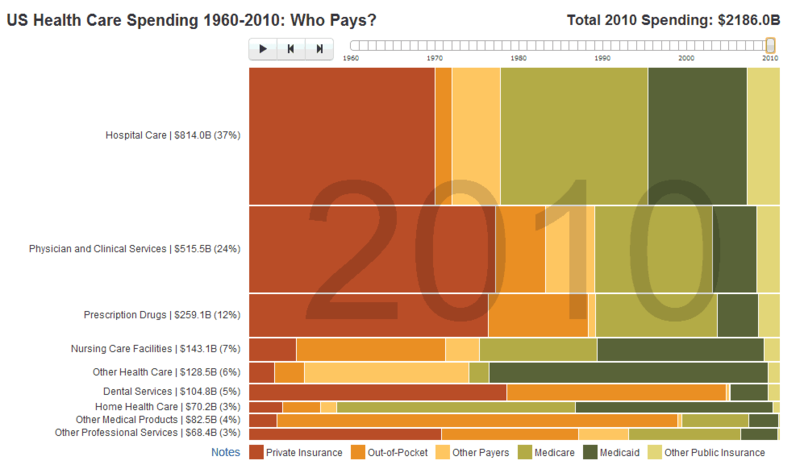 Josh Cothran did a visualization of who is spending health care money. 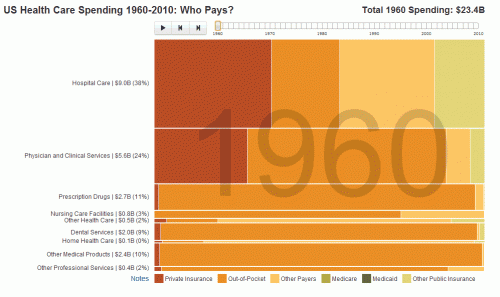 Just look at the 1960 and 2012 charts, and pay particular attention to the orange "out-of-pocket" number. Another way to rewrite these charts is to say consumers care about prices for spending in the orange band only. I agree that the pricing in health care is often arbitrary and capricious. Of course some suppliers are going to try to soak third party payers. But I don't think simply changing the payer (from private to public) or having a government bureaucracy set prices for millions of line items is the solution. My diagnosis is that health care lacks the one thing we have for most every other product or service: shopping. Now, you try to head off this argument with a few folks who claim shopping is impossible in health care. But that is absurd. There is a large and growing community of us who have real health insurance, rather than pre-paid medical plans, which means we have high deductibles. We pay all of our regular expenses out of pocket, and maintain health insurance for large, unpredictable, potentially bankrupting expenses. I must admit that shopping for health care seemed odd and a bit intimidating at first, having lived for years in the world of gold-plated, pay-for-everything corporate health care accounts. But it really is not that hard. I have consistently knocked down the cost of everything from x-rays for my kids' fractures to colonoscopies by a half to two-thirds. I am now used to doctors and providers having that second price book under the counter they go to if they know you don't have a third-party payer they can soak. We always research and ask for generics. We think twice before accepting the need for an expensive test, like a MRI, and price shop it if we have to have one. I push back on my dentist who tries to x-ray my teeth every few months. I have many friends that saved a ton of money on oncology treatments by just doing a little shopping. I am exhausted with academics and writers who have never tried to shop for health care telling me it is impossible. Many of us do it, and there are more and more resources out there for us. Sure, there are certain things I am not going to have the time or ability to price shop -- if I am lying on my back having a heart attack, my wife (hopefully) is not going to check rates at the hospitals. But it is a fraud to extrapolate from this minority of health care situations to all health care expenditures. The other argument is used is that at the beginning of a health care interaction we may not know exactly what care is needed. So what? The same is true of auto repair, but I don't blithely allow the repairs to proceed at any cost just because I didn't know up front what the diagnosis would be. I get an estimate when each new problem is found, and I have on several occasions interrupted a car repair, told them their price was too high on certain repairs, and went elsewhere for the repair or deferred it entirely. Let's suppose there is some sort of market failure for 10-20% of health care charges where price shopping is impossible. Then let's discuss government regulatory approaches for those situations. But for the other 80-90%, we should be structuring a health care system where consumers provide the price regulation, as they do in nearly every other industry, by shopping. As a note, some people are exhausted by the idea of shopping. My first response is, so what? Get over it. We are not going to take over a whole industry just to free you from a bit of hassle. The second response is that research shows that only a small percentage of buyers need to be price shoppers to enforce price discipline. I generally trust that Amazon has low prices and don't always check them, because I know there are much, much more rabid people who do care and do check. Over time, I have found physicians who are both sympathetic and cooperative with this approach and actively help us minimize the cost of our care. Its just amazing -- somehow we accept this image as a doctor being above all this cost stuff, in fact with considerations of price and cost being corrupting to their mission of keeping us healthy. Imagine a car mechanic that took that attitude -- "I'm the expert here and you will pay whatever it costs to do what I say you need to do." Would you fire the mechanic and find a better and cheaper one, or would you suggest that what we really need is a massive new government bureaucracy to set prices for every imaginable repair a car might need. Sometimes I suspect much of the support for government health care is from people who see shopping and taking responsibility for their own care as too much of a hassle. I have been warning you, its coming. When government pays the health care bills, they can then use that as an excuse to micro-regulate our every behavior. Because its no longer an individual choice, it affects public costs. As an aside, given that Scandinavians tend to have among the world's highest tolerances for taxes, when they get fed up, it must be getting bad. Its amazing to me how many ways supporters of government health care can find to rationalize the bad incentives of third-party payers systems. Take, for example, the prevelance today of numerous, costly tests that appear to be unnecessary. Obamacare supporters would say that this is the profit motive of doctors trying to get extra income, and therefore a free market failure. I would point the finger at other causes (e.g. defensive medicine), but the motivation does not matter. Let’s suppose the volume of tests is truly due to doctors looking for extra revenue, like an expensive restaurant that always is pushing their desserts. In a free economy, most of us just say no to the expensive dessert. But the medical field is like a big prix fixe menu — the dessert is already paid for, so sure, we will got ahead and take it whether we are hungry or not. It should be no surprise that while US consumer prices have risen 53% since 1992, health care prices have risen at nearly double that rate, by 98%. Recognize that this is not inevitable. This inflation is not something unique to medical care — it is something unique to how we pay for medical care. 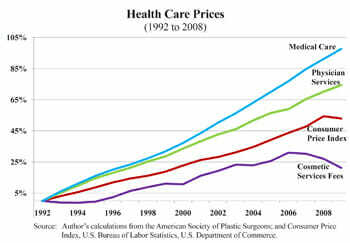 Contrast this inflation rate for health care with price increases in cosmetic surgery, which unlike other care is typically paid out of pocket and is not covered by third party payer systems. Over the same period, prices for cosmetic surgery rose just 21%, half the general rate of inflation and just over one fifth the overall health care rate of inflation. This is why I call free market health care the road not traveled. There are many ways we could have helped the poor secure basic health coverage (e.g. through vouchers) without destroying the entire industry with third-party payer systems. Part of the problem in the public discourse is that few people alive today can even remember a free market in health care, so its impossible for some even to imagine. Update: Coincidently, Mark Perry has a post that addresses just the issue I do in my article, that is the positive effects of high-deductible health insurance and out of pocket health expenditures on pricing transparency and reduced costs. The high deductible health plans at GM seem to be having a positive effect on the health care market. A shame they will probably be illegal under Obamacare. Of course, since GM is owned by the government, it can get any special rules that it wants, unlike the rest of us. But that his how things work in the corporate state. New stand-alone fast food restaurants have been banned from setting up shop in South Los Angeles, due to rising health concerns by the city council. Perry's new plan bans new so-called "stand alone" fast food restaurants opening within half a mile of existing restaurants. So McDonald's, who is likely firmly entrenched in the area, is unaffected, but potential new entrants challenging McDonald's are out. Such stand-alone establishments are on their own property, but those same restaurants are OK if they're a part of a strip mall, according to the new rules. Obviously the same food is much more nutritious if served in a leased building rather than on a piece of land the restaurant owns itself. When health care is paid for by public funds, politicians only need to argue that some behavior affects health, and therefore increases the state's health care costs, to justify regulating the crap out of that behavior. "Too many lives are lost in motorcycle accidents," Christopher A. Hart, NTSB vice chairman, said in announcing that helmets had been added to the board's annual "most-wanted list" of safety improvements. "It's a public health issue." My column this week at Forbes.com is on government health care and the incentives and pressure it creates to micro-manage individual behaviors and diet in order to (in theory) reduce government health care costs.